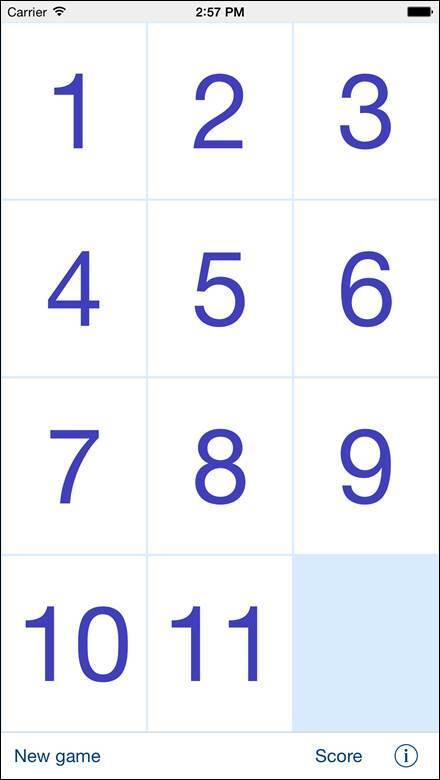 SortIt and SortItPro is digital version of the classic combinatorial game 15-Puzzle, invented 1874 in USA. Game is also called Gem Puzzle, Boss Puzzle, Game of Fifteen, Mystic Square, 16-puzzle. The famous chess player Bobby Fischer “was an expert at solving the 15-Puzzle. He had been timed to be able to solve it within 25 seconds” [WikipediA]. · “9 x 11” on iPad, iPad mini. The goal of game is to sort the buttons from the upper left to lower right corner. At the end of the game the bottom right corner should be empty and all buttons should be ordered in numerically: 1, 2, 3 ..., left to right, top to bottom. Game result can be saved in score database. Starting from version 3.0 app supports iCloud data synchronization - data on all iOS devices with same iCloud account will be synchronized. You can decide what kind of data should be synchronized (saved in iCloud); rest of data is saved locally. · Shape and size of buttons. · Way of counting of score. · Data which will be synchronized. App “Help-function” available in the app or on WWW contains detailed description of all functions, and options. All app activities and events are recorded in the system log. Statistics about the app usage are accumulated. App is optimized for iOS8, iOS7, iOS6, iOS5. Pro-version does not contain advertisement banner in main game view. If you have any questions, problems or suggestions for improvements, please contact me: sortit@jz-it-konsult.se.